Purpose: We report a rare case of silicone oil droplets adhering to the posterior surface of an intraocular lens (IOL) after removal of silicone oil for a patient with retinal reattachment, who had a history of pseudophakic rhegmatogenous retinal detachment. Case report: A 45-year-old male with a history of cataract surgeries of both eyes developed pseudophakic retinal detachment in his left eye. He received surgeries of scleral buckle and standard 3-port pars plana vitrectomy with silicon oil tamponade. With retinal attachment for 7 months, he underwent removal of silicone oil in the left eye. 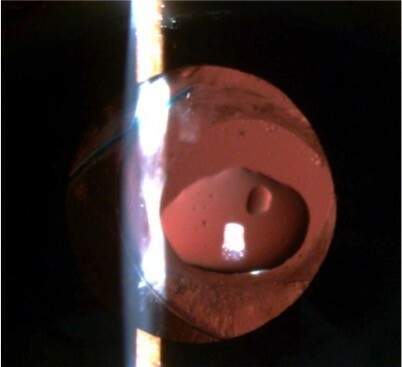 However, a big silicone oil droplet was found on the posterior surface of the IOL with complaints of distorted micropsia and poor vision, a month later. Pars plana vitrectomy using a 20-gauge vitreous cutter, which was supposed to have a higher cleaning capability compared with a smaller size device, was performed to aspirate the main part of the big oil droplet. The residual dispersed smaller droplets at the center of the visual axis were swept peripherally using a 27-gauge bending tip cannula. Fortunately, the patient regained his vision of 20/20 without distortion and micropsia in his left eye. Conclusion: This was a rare case where silicone oil droplets were found adhering to the posterior surface of an IOL after removing silicone oil a month later. We used a 20-gauge vitrectomy system to remove large oil droplets and swept smaller ones off the visual axis to improve the vision and visual quality.